Holders Lahore Lions defeated spirited Peshawar Lions 1-0 in an absorbing final of the 2nd Women Hockey Super League at the National Hockey Stadium, Lahore. Areeba Sarwar scored the all important goal. The two sides began in a cautious manner. There were hardly any circle penetrations or goal attempts in the first quarter. The match became fully alive in the second quarter. Good up and down stuff ensued with fine moves from the two sides. First Peshawar earned a penalty corner fetched by their main play maker Maira Sabir but failed to cash in on it. Then, in the 24th minute, Lahore had their first PC. After three touches, ball reached Areeba Sarwar close to the goal, who brilliantly dived to flick the ball into the net. Second half also saw fast paced game with both the sides entering the opposite circle. There were open chances as well as penalty corners. Lahore earned six PCs while four came Peshawar’s way. However, it ended 1-0 in favour of Lahore Lions when hooter sounded for the last time. Both the teams displayed attacking hockey and had their moments but Lahore, who had topped the league stage, were the deserving winners in the end. Earlier, in the third position play off, Karachi Dolphins riding on Tehmina Mustafa’s hat trick defeated Quetta Panthers 6-3 in a high scoring match. 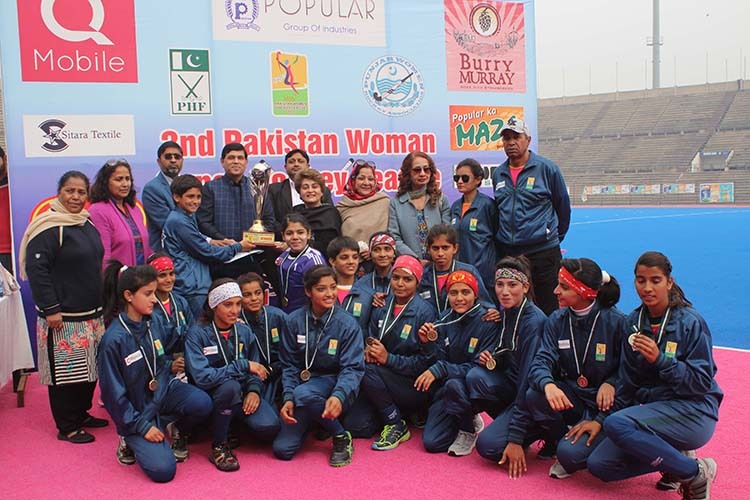 Chief guest Mr Imamuddin Shoqeen, the chairman of Popular Group, presented the trophy to Lahore Lions, who were also given Rs 1 lac in prize money. Runners Up Pehsawar Deers got richer by Rs 75,000. The other three sides, Karachi Dolphins, Quetta Panthers and Islamabad Shaheen were given Rs 50,000 each. All three were also rewarded with Rs 10,000 each.